Mazda officially introduced the all-new 2014 Mazda3 hatchback at a press event in New York today. The automaker says in a press release that the 2014 Mazda3 is completely redesigned, sharing almost nothing besides its name with the 2013 model. “With more than 3.5 million vehicles sold globally, the Mazda3 is the brand’s best-selling and most recognizable nameplate, and its redesign for 2014 shows just how much attention to detail and care we put into this important vehicle,” says Jim O’Sullivan, president and CEO of Mazda North America Operations. Compared with the outgoing Mazda3, the new hatchback has a longer wheelbase, but it’s also slightly shorter, lower and wider. Mazda says that the result is an interior that offers more shoulder room in both rows, as well as comparable headroom to the car it replaces. An all-new Active Driving Display also debuts in the 2014 Mazda3, which displays information like navigation directions and speed on a clear pop-up panel. Mazda says that its Active Driving Display keeps vehicle information within the driver’s line of sight, and that the panel folds into a hidden position when the car is turned off. 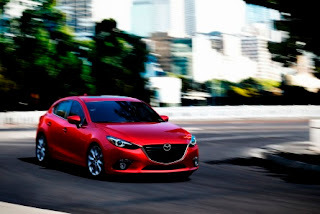 For 2014, the Mazda3 will continue to offer the Skyactiv-G 2.0-liter four-cylinder engine, as well as the Skyactiv-G 2.5-liter four-cylinder engine that’s currently available in the 2014 Mazda CX-5 and Mazda6. Mazda hasn’t provided fuel economy estimates for the redesigned Mazda3 yet, but the 2.0- and 2.5-liter engines will produce 155 and 184 horsepower, respectively. A six-speed manual or a six-speed automatic transmission will be available. The redesigned Mazda3 will have a new infotainment system, which Mazda says will come with Bluetooth, a USB port and an auxiliary input jack. The new system will also respond to voice commands and read emails and text messages through the speakers, as well as Twitter and Facebook updates. A Bose surround-sound stereo system and a navigation system will be optional. The Mazda3 will also offer a number of new safety technologies for 2014, which Mazda calls i-Activsense features. These include automatic high beam control, which can automatically adjust your headlights for oncoming traffic and radar-based cruise control, which automatically adjusts the car’s speed based on the distance and speed of the car in front of it. Blind spot monitoring and lane departure and forward collision warning systems are also offered as i-Activsense features. Mazda’s Smart City Brake Support system will also be offered, which can automatically apply the brakes or increase breaking power at speeds less than 19 mph if an obstacle is detected. The 2013 Mazda3 is currently our top-ranked affordable small car, so will Mazda’s updates make it an even stronger contender? We’ll see how the redesigned Mazda3 stacks up to the competition when it goes on sale this fall.